I had watched the rest of the series when it was broadcast and blogged it instantly. I couldn’t do that for the last episode because I was away at a conference to do with my work. Not many people work on a Sunday evening, but I think Niall would approve. In the West we used to work hard, and now most of us don’t any more. And this may be our undoing. 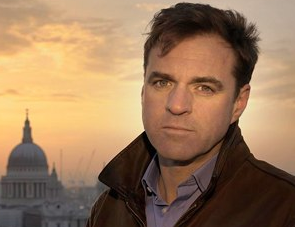 Niall Ferguson’s accent is a bit odd. It has strands from Scotland, England and America. But his attitude to work is distinctly in tune with his protestant Scottish heritage. The idea that protestant Christianity has a specially positive attitude towards hard work is well known hypothesis. It originates from the work of Max Weber and the phrase Protestant Work Ethic is used far outside the circles of history and sociology. So the thesis is that the protestant form of Christianity has an ethic that makes hard work Godly and leisure and enjoyment sinful. It also creates networks of people who are honest and trust one another. Put that together and the effect is strong enough to promote economic growth. It was certainly the case that early industrialisation was very closely associated with places which were also protestant- America, Germany and Britain. And within these countries there did seem to be an association with the most protestant parts being the most industrial. But has theories go, it is very easy to find counter-examples. You might just look at catholic France and compare it unfavourably with protestant Britain. But it is a pretty marginal difference really. If the island of Britain had for some reason sunk in 1750 it is hard to imagine that France would not have rapidly filled its place as the world superpower of the nineteenth century – and in fact even with competiton from Britain it did a pretty good job of developing a highly successful sophisticated modern economy. And the undeniably protestant Boers of South Africa are hardly an example of economic success. But there is one huge exception to the rule that Ferguson more than anyone else is only too aware of. For the most remarkable example of sustained economic growth in the history of the world comes not from a protestant country or even a Christian one. Since 1978 China has grown consistently and at a faster rate than any other country has ever achieved for such a long time. And it continues to do so. How does this fit in with the idea of protestantism being a key economic advantage? Well lets not give up on an idea without looking into the details. There obviously aren’t many protestants in China. But are there enough? It turns out that there are rather more than you might imagine, and Ferguson finds some and interviews them. In large Chinese cities churches are flourishing and growing, and some of these Christians are playing a big role in the development of the businesses that form the basic cellular unit of the astonishing growth in the Chinese economy. It is surprising to learn that proportion of Christians in China is around 3-4%. Given that the population is huge this translates to many millions, perhaps even 100 million if the most generous interpretation is given of the data. But even so, it is hard to imagine that such a small group could have such a disproportionate impact on the country as a whole. One thing is for sure, Chinese economic development has been carried out with explicit support and approval from the government which remains hostile, or at least not particularly positive about Christianity. Interviewing a few local Christians doesn’t really enlighten the situation much. And again, given its size it isn’t all that surprising that the world’s biggest manufacturer of Bibles is situated in China. But it is something to ponder. Unlikely as it seems that one particular variation of a pretty widespread religion is particularly adept at encouraging its adherents to get on in the present, it isn’t totally inconceivable. It could be a side effect of some feature for example. Maybe the emphasis on reading the Biblical texts yourself which is one of the features of protestantism encourages literacy which in turn encourages the adoption of new ideas and technology. I would have been interested if this aspect had been pursued. Instead Ferguson, who towards the end of the programme admits to having imbibed deeply the protestant work ethic himself, goes in a different direction. Is the work ethic vanishing in the West and does it matter? Yes it is and yes it does is the answer we get. I was a bit uncomfortable with that conclusion. Most generations view the succeeding generation with a mixture of contempt and despair. Things, after all, didn’t happen like this in my day. We knew what was what and these youngsters don’t even knew they are born. But is this in fact the case? The Chinese certainly do work harder than modern Americans and Europeans. But they are still a lot poorer. The benefit they get from getting even slightly richer than they are is pretty large. So is it a problem that the Chinese are working hard to catch up? I suppose it could be but I think it is simply the way the world is. If I was in their position I would do the same. But the object of all economic activity is consumption. The Chinese no doubt will slow down a bit when they have some money to spend. I don’t think that anyone is behaving any differently to how you would expect them to. I dare say there are some people who would rather the Chinese stayed poor and powerless, but if you don’t then it is hard to see how things could be any different. So the final suggestion in the form of a question that the West is in decline basically because all the factors that led to its rise were now available to the rest of humanity and we are too lazy to do anything about it. Well maybe this is true, but I can’t help thinking that the case has not really been made. We haven’t actually lost anything other than advantages we used to have. This might make it harder to feel superior, but it is hard to see how it actually makes us any worse off. So another good programme that kept my attention to the end. Ultimately, I didn’t buy into the pessimism. I don’t think that protestants are really the key to economic growth. Lots of people who aren’t protestants seem to be quite capable of managing the trick. And I don’t think that somebody else doing well in any way undermines the achievements of the West. At the end of the day, it is just an abstract idea after all. Life is lived by individuals, and it is what they do that history is made up of. Previous PostMiracles: Gibbon’s Decline and Fall of the Roman Empire Chapter 15 Part 3Next PostDurruti – Ever heard of him?